Like any major city, Seoul faces a similar cyclical issue of a neighborhood's rise, its gradual gentrification, and then a sky rocketing in price for the surrounding area. Sinsa and particularly the Garosugil area is a prime example of this. What began as a refuge for artists and creative folks to set up shop and hangout has effectively been taken over in recent years by global and local chains, pushing out the original tenants, and leaving in its wake exorbitant prices everywhere. Sure, you can find ample mediocre pasta and steak restaurants at around the 12-20K range (or about double the cost of an average lunch meal of 6-10K) or you can pay even more for pretty decent pasta and steak for about 50K (or about 5 times the price of a regular meal). In short, Sinsa has become a rather dull affair in gastronomy, with just about the only restaurants in the area that can afford the rent being either a major chain restaurant or a restaurant that focuses on in-demand eats (like said, pasta and steak). So what's someone to do if he or she is looking for some decent Korean food (that hasn't been fusionized into something involving cheese) without paying an arm and a leg in the hood? Enter Dddal Boo Jah Ne Boolbaek. The casual eatery is already a well known favorite for nearby business folks for lunch, dinner, or even friends for a drink. The name is actually quite fun as Ddall (daughter) booja (rich) means an abundance of daughters and refers to the owner of the chain of eateries (3 altogether in the general Gangnam area) who runs the business together with his daughters. The menu is rather simple and has plenty for anju (food with drinks): spicy pig hocks, deep fried stuffed peppers, kimchi jeon, ramen, fried rice, naengmyeon etc, but the greater popularity lies in their pan fries for meals. It's really a no-frills, cheap eats kinda place that admittedly uses some imported ingredients but really, all things considered, it's fine. More than fine, it's fantastic actually. Feast your eyes on the ddalboolbaek (7,000 per serving). Thin, marinated pork slices are tossed together with vegetables on a fiery pan and then brought out sizzling to your table. Since everything comes pre-cooked, but still cooked to order, you're not smoked out and smelling like a fire pit afterwards but instead you get an expertly cooked pan fry. I mean look at that bits of crisp on the meat edges! Savory, salty, and just a hint of spice, this seems to be the most popular stir fry of the two. If you're craving something less spicier or just beef, you have the beef bool baek (9,000 won per serving). It's essentially a crispier/dry bulgogi that's been pan fried and still a delicious mix of crisper beef, onions, and other goodness. Really, this is one of those diamonds in the rough that you get to appreciate as time goes on. Whether you're looking for a quick and inexpensive eat in the area, craving some Korean food, or just wanting some good food in general, Ddalboojane should appeal to almost everyone. Filling, inexpensive, and tasty, this is one of those places that can only be universally well-received by visitors and locals alike. Its value, especially considering its location, makes it a great place to grab a meal or even anjoo at any day and time of the week. This can be a bit of a doozy to navigate for first timers but referencing the map above, come out of exit six and walk 20 meters or so until you get to big alley turning into your right with a Woori Bank at the alley opening. Walk straight down that alley, passing a four way intersection at the 50m mark, for about 120 meters until you get to a three-way intersection. Turn left at that three way intersection and go up for about 200 meters and you should see Ddalboojane Boolbaek on your left (I think it's next to a Bongu Beer but that could have changed, again, considering Sinsa's continued gentrification). 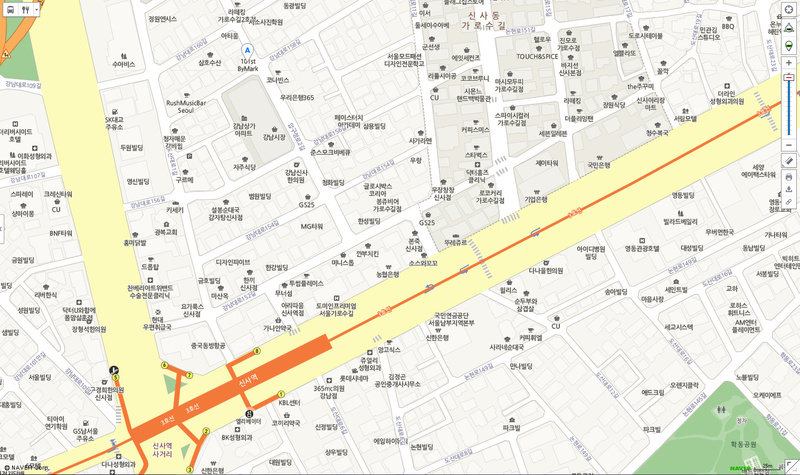 There are two other branches- one in Gangnam (just straight up 70 meters or so in that the alley behind CGV) and one in Yeoksam (second alley on your right after you come out of Yeoksam station exit 5). They also do some seasonal promotions like a pan fry and naengmyeon combo in the summer. Stewart, this is what we like about your review..... simple food joint with affordable and good meal. We ordered the ddalboolbaek , Hanchi boolbaek and Stuffed fried Green Chilli ......the best are the ddaalboolbaek and the stuffed green chilli, my family loved the food and one of my sons had a second helping of the bab , that I have to remind not to overeat......he he he so good....thanks for the recommendation !! For the ddalboolbaek - is there any minimum order requirement? Do they accept order 1 person serving? ?